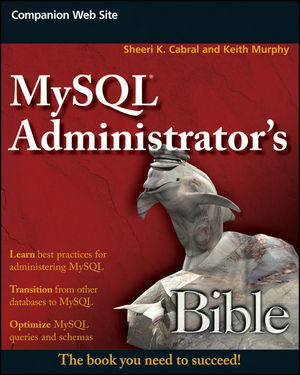 I’ve decided to give people two more days for a chance to win a free MySQL Book — Sheeri Cabral’s MySQL Administrators Bible. I have had five people so far provide recommendations for a simple MySQL configuration question as stated in For MySQL DBA fame and glory. Prize included. Shlomi Noach the current front runner. Try your MySQL Performance Tuning skills. This is a good opportunity for new MySQL DBA’s and experienced DBA’s to provide basic input. Never store the MySQL ‘root’ user password in a ~root/.my.cnf file. There is simply no reason to do so, and you expose your database to destruction or manipulation when a user has access to the ‘root’ OS user, for example via sudo. I’ve heard excuses why the ‘root’ MySQL password has to be in a file, I’ve yet to be convinced. Do you need to store a MySQL password in a file? Yes. Connection management for your application is an example, however that use should never be ‘root’ user to connect to your application. You may also need to run scripts to backup your data with mysqldump. The solution is to create a dedicated user .e.g. ‘backup’, and then grant that user only the permissions necessary to do the specific task at hand. By default, a simple mysql command will never grant access without any authentication, the user will need to find the password. As David Minor pointed out in comments, you can also with MySQL change the ‘root’ user name, which is not a bad idea for improved security. The follow steps perform this. More information see the MySQL 5.1 Reference Manual at MySQL Privileges, Create User and Grant Syntax. For MySQL DBA fame and glory. Prize included. I came across the following configuration today on a Production MySQL system (5.0.67) running 30+ blogs using WordPress MU. No I did not truncate the output. I could say I’ve seen worse, but that’s a stretch. So the quiz and a prize for the best response, for the next 48 hours I’ll accept your comments as responses to this post for the top 5 settings you would add, and additionally what information you may need to add these settings. Bonus points for giving a reason why you would add the settings as well. For example, I’ll give you the most obvious. To determine a key_buffer_size to start with I would look at the size of all Indexes via I_S, and combine with some estimate of growth, say 2x-5x. For the best answer with the top 5 settings, I’ll send you a copy of Sheeri Cabral’s book MySQL Administrators Bible which even I as a resident MySQL Expert has enjoyed scanning and learning something new. Recently on a client site I had to fight the pain of having no way to confirm loss of data integrity when optimizing data types. Due to MySQL’s ability to perform silent conversion of data, when converting a number of columns we enabled sql_mode to catch any truncations as errors. This ensured that should any data truncations occur, an error is thrown not a warning. The following shows an example case study for converting an INT to TINYINT UNSIGNED and shows that without sql_mode silent conversions occur. The process however for the client included converting a number of DATETIME columns to DATE columns. The input data specification called for the input values to be dates only so storing and using DATETIME was simply a waste of space. Unfortunately the use of sql_mode didn’t help here, so the combination of changing multiple columns in one time simply meant it was impossible to determine if any truncations occurred. This combined with the sheer data volume, tables between 10GB – 500GB, with 10 – 100 million rows. It is of course impossible to run individual ALTER statements on columns. Of the top 10 tables, excluding the largest, alter times were between 3 and 15 hrs. The only solution is to run pre SQL checks on the data to search for the boundary conditions manually. This is not the ideal solution for a customer. As the recipient of the 2009 MySQL Community Member of the Year award I received a MySQL crystal ball. While it looks good in my bookcase, unfortunately the best advice I can offer during this time of uncertainty is “watch this space”. The Oracle acquisition of Sun, owner of MySQL. The future of Falcon in MySQL 6.0? Thanks to Julian Cash of the Human Creativity Project of his photograph at the 2009 MySQL Conference. View Photo. View all 2009 MySQL Conference photos. The announcement last month of Oracle to acquire Sun continues to warrant a lot of discussion over exactly what Oracle will do with MySQL. Only time will tell what will happen with the official product, however it is important to remember that MySQL is GPL, there will always be a free version of MySQL available for popular LAMP stack products such as WordPress and Drupal and new and existing startup’s will continue to use MySQL. For more information check out my MySQL for the Oracle DBA Resources. I recent visit with old Brisbane friend HiTCHO which I met at the Brisbane MySQL Users Group in 2005, has lead to this cool list of some hardware and software technologies he used that I am now considering or have already implemented or purchased. Snoop – A GNU/Linux file descriptor monitoring tool inspired by FreeBSD’s ‘watch’. Canon PowerShot SX1. True HD in a Canon compact digital camera.